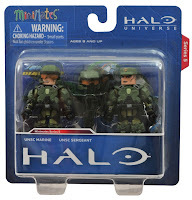 Here's the two-pack you're gonna want a dozen or so of- the UNSC Marine and Marine Sergeant pack. Why you ask? 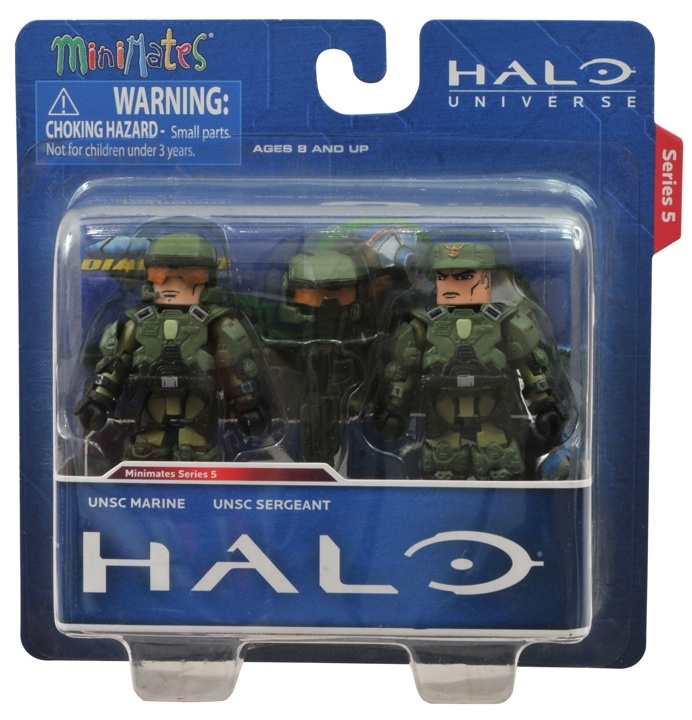 Because you can swap out the Sarge's helmet and make him a second devil-dog. 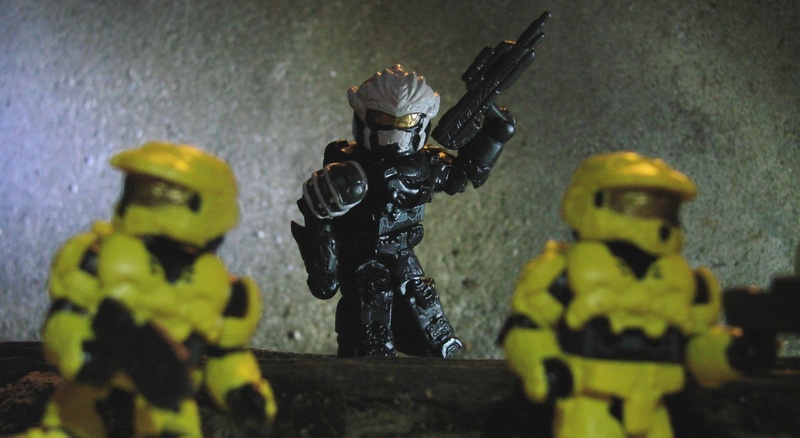 Double the Marines, double the soldiers- and that means 'troop builder' fans should take note, dear friends. 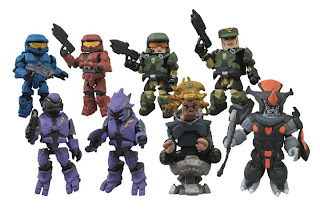 Actually, if you want to get technical, almost all the new figures in these packs are troop builders. 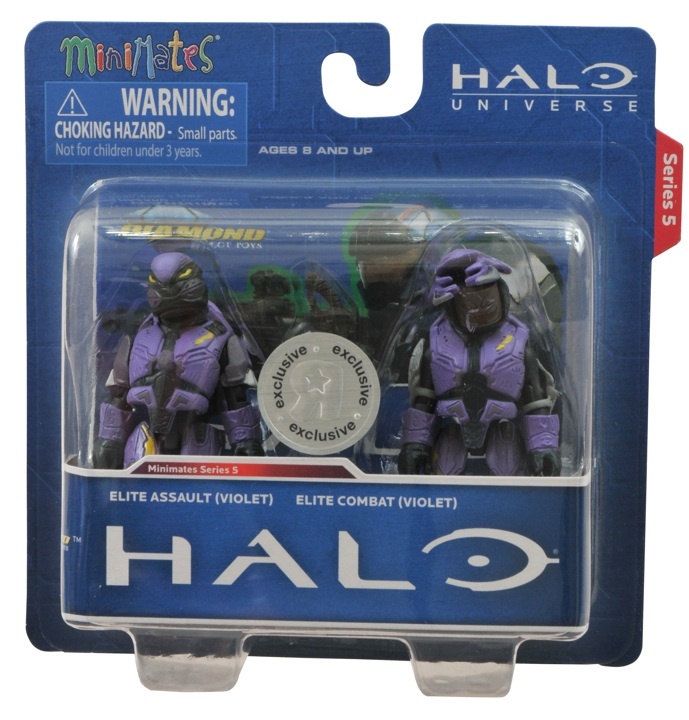 There are Brutes, Elites, Marines, and Spartans aplenty. 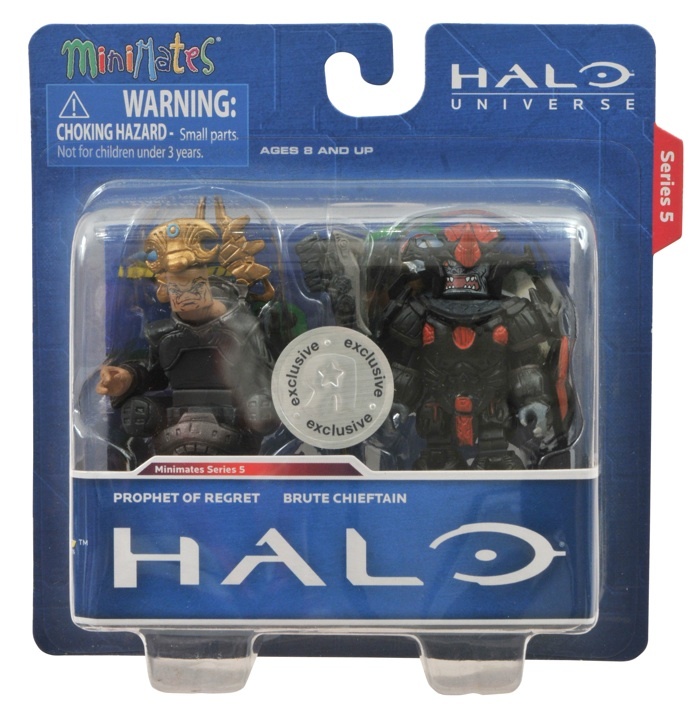 There's even a Prophet to boss everybody around (just watch out for Flood infection forms K?). 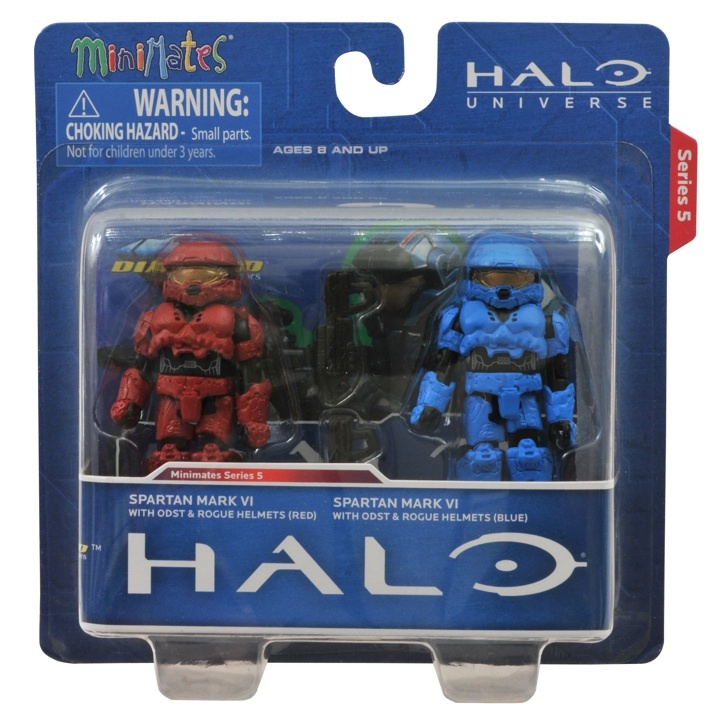 - The UNSC Marine and UNSC Sergeant come with two assault rifles, plus an extra helmet to turn your Sergeant into another Marine! 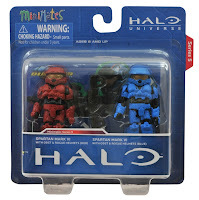 DOUBLE MARINES!- The Red Spartan vs. Blue Spartan two-pack comes with two assault rifles and four extra helmets -- two Rogue and two ODST -- so you can add some diversity to your squad!- The Elite two-pack includes an Elite Assault with Spiker and an Elite Combat with Needler, both in a lovely shade of violent-- er, I mean violet. 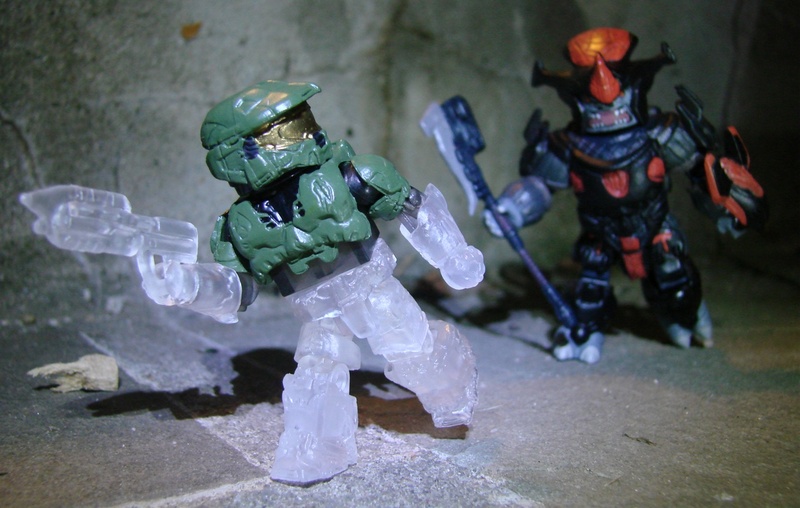 Build a purple power base!- The Prophet of Regret comes with a Brute Chieftain, and while the Chieftain gets a gravity hammer, the Prophet gets fancy new belt pieces for his pals Truth and Mercy! The two-packs are TRU exclusives, but there's also a 4 piece boxed set that's heading to comic shops. 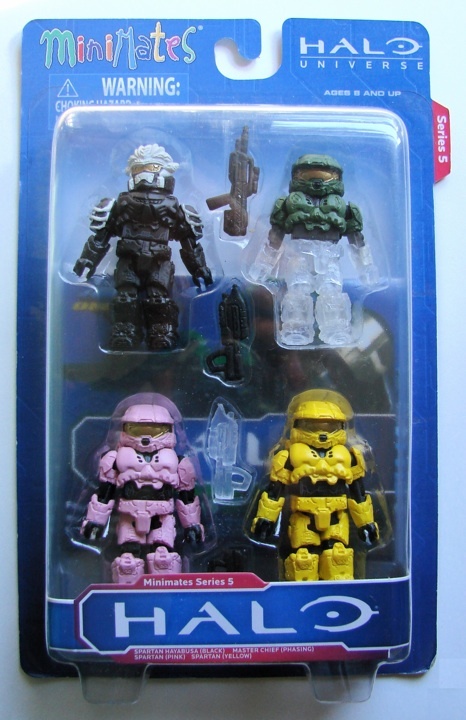 That one will include a pink Spartan, a yellow Spartan, a black Hayabusa, and a semi-invisible Master Chief (which looks awesome). 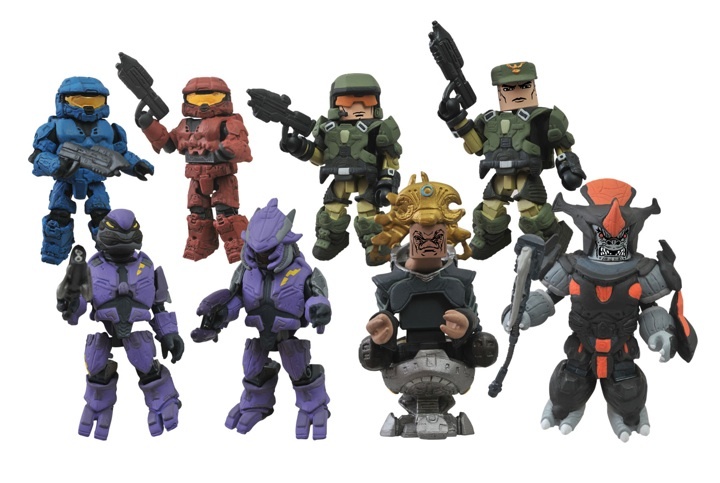 All Minimates are on a 2" scale and have a monster 14 points of articulation, which is pretty darned impressive for a figure that small. Look for all the double packs to be available at Toys R Us soon (or right now) and the four pack set to be nestled into your local comic or specialty shop this week. Not sure where you'd go for a 'comic or specialty shop'? Click here and visit the Comic Shop Locator, they'll help you out with that.